All About Sun-Moon Midpoint in Astrology. Detailed interpretations of Sun-Moon Midpoint, and its importance. The Sun Moon Midpoint in astrology, and more specifically in the natal chart, is a highly sensitive and personal point. It is a mathematical point–the point midway (or exactly halfway) between the Sun and the Moon. The Sun/Moon midpoint is represented by the symbols, or glyphs, of the Sun and the Moon, separated by a slash that indicates a midpoint. 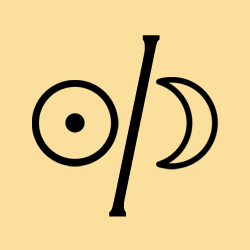 Inherent in the symbolism of the Sun/Moon midpoint is the desire for companionship. The Sun/Moon midpoint represents a point of “inner marriage” and symbolizes close personal relationship. This point is very important in any kind of relationship analysis, in addition to natal chart work. In synastry, the Sun/Moon midpoint is very often activated by the other person’s personal planet in significant relationships. If another person’s personal planet, and especially the Sun or Moon, forms an aspect such as the ones referred to above, that person represents some kind of promise of integration to the Sun/Moon midpoint owner. Whether or not integration actually happens, this synastry connection offers a promise which can be difficult to resist. Therefore, it is a strong indicator of attraction. Many astrologers assert that significant relationships that lead to marriage or a similar commitment contain at least one of the following interchanges in synastry: one person’s Sun aspecting the other’s Moon, and/or one person’s personal planet aspecting the other’s Sun/Moon midpoint. In order to understand the symbolism of the Sun/Moon midpoint, one must understand the symbolism of midpoints in general. Ebertin, respected as an authority on midpoints, defined the midpoint as a sensitive point in a chart where the influence of the two planets involved combine together. The midpoint of the Sun and Moon in a natal chart is a highly sensitive point. It is calculated by adding the position of the Sun with the Moon and dividing by two, so it is literally the midpoint between the Sun and the Moon! Determining the Sun/Moon midpoint of any chart involves taking the midpoint between the Sun and the Moon. When working with midpoints, the best technique to use is to first convert the positions of the planets to the 360 degreezodiac. Sun is 175 degrees 21 minutes. Moon is 358 degrees 25 minutes. In order to determine the midpoint of the Sun and Moon, we must add the two points together and then divide by two. A midpoint is literally the point midway between two points. Therefore, we must add 175 21 and 358 25. We get 533 degrees and 46 minutes. Dividing this figure in two, and we arrive at 266 degrees and 53 minutes. We then convert this figure back to zodiac format. Since 266 degrees is 26 degrees beyond the Sagittarius starting point, we come to the point 26 Sagittarius 53 (26°53). Because in this example the Sun and Moon are more than 180 degrees away when we travel through the zodiac in logical order, common practice is to convert the midpoint to 26 Gemini 53 (the opposite point of 26 Sagittarius 53), simply because it is the closer midpoint between the Sun and the Moon. This is not highly significant in midpoint work, simply because oppositions and conjunctions are not considered to be muchdifferent when we deal with midpoints.